Lansdowne Democrats > The Leader > Lansdowne Leader – May 2018 > Help Us Make Lansdowne the Town that Votes! A vibrant democracy requires the active participation of its citizens in the voting process. The U.S. ranks 31st out of 35 developed countries in terms of the percent of eligible voters who vote. Approximately 20 percent of eligible voters in the United States are not even registered; and an even larger percent of those registered do not vote. Voter turnout is especially low in local elections, slightly better for state elections but still too low to be considered active voter engagement. How Can We Improve Participation in the Election Process? A group of Lansdowne residents have started the non-partisan Lansdowne Votes (LV) Campaign to make Lansdowne the town that votes! The initial organizers of this effort were Caryl Carpenter and Christine duBois-Buxbaum, both residents of Lansdowne. Our goals are to: 1) register 125 new Lansdowne voters in honor of Lansdowne’s 125th anniversary; 2) increase the turnout of registered voters in the 2018 mid-term election, compared to the 2014 mid-terms; 3) increase awareness of the importance of voting among all residents of Lansdowne – young and old – through educational programs. The Lansdowne Borough Council passed a resolution of support for the LV Campaign. We have also been endorsed by the Lansdowne Economic Development Corporation and the Lansdowne Business and Professional Association. Use registration, voting, and real estate transfer information to identify homes to target for the registration drive. Register seniors at Penn Wood High School. This has already happened. Ninth graders in a civics class volunteered to help register seniors who will be 18 before the registration deadline in April. (Approximately 100 students registered during a school assembly on March 12th.) Another registration assembly is planned for the Fall. Offer educational programs about voting to the Boy Scouts, Girl Scouts and the Boys & Girls Club in Lansdowne. Organize a poster contest about voting for students at Ardmore Avenue and Lansdowne Friends elementary schools. Visit all Lansdowne churches and the Buddhist Temple to elicit their support and help to reach eligible voters in their congregations. Distribute LV material to display in Lansdowne businesses and professional offices. Create a website and a presence on social media such as Instagram and Snapchat. Make LV info available at community events such as the Farmers Market. We want to make this a community-wide effort that involves as many Lansdowne organizations as possible. We welcome other suggestions about how to engage our residents. How can you become involved in the non-partisan Lansdowne Votes Campaign? 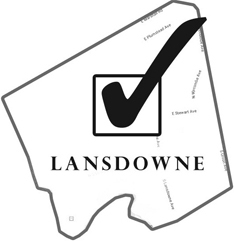 Volunteers are welcome and needed to participate in any aspect of the Lansdowne Votes Campaign. Donations to cover the cost of materials are also needed. To find out how to volunteer or how to donate, send an email with your name, address, and email address to lansdowne.votes@gmail.com.